Stress impairs memory – but there's one things students can do to offset its effects. It is well known that stress can impair memory. Everyone has had some experience of this kind. As a student suffering test anxiety, grades are likely to suffer. In high-stakes social or business interactions, the stress may well cause memory to fail us, such as when we forget a friend’s name in the process of making a social introduction. How does stress do this? Is there anything we can do about it? First, we need to know what stressful events do to the body and brain. Brain freezes probably occur because thinking can get so preoccupied with the stress-inducing stimuli that other thoughts cannot emerge. But other kinds of stress-induced memory impaired come from the well-known “fight or flight” response in which stress activates the release of adrenalin into the blood stream. Adrenalin has many bodily effects that support fight or flight, such as raising heart rate and blood pressure, and increasing arousal perhaps to the point of anxiety and fear. The increased attentiveness may have a fleeting beneficial effect on memory, as has been demonstrated in laboratory experiments. But the other effects of adrenalin on anxiety and distress are likely to impair memory. The other thing that happens during stress is the activation of the anterior pituitary gland’s release of ACTH, which in turn activates another part of the adrenal gland to dump cortisol into the blood stream. In the short term, cortisol can have many beneficial effects for combatting stress, such as mobilizing white blood cells and enhancing the immune system. But cortisol binds to cells in the brain’s hippocampus, the area that converts new experiences into memory. This binding actually disrupts the memory-forming process. Ultimately, if stress continues, the synaptic regions deteriorate, making the impairment permanent. This new research was aimed at testing the possibility that forced retrieval might protect learners from the memory deficits caused by stress. In the study on the first day, 120 subjects studied a list of 30 nouns or images of nouns one at a time. Then, one half of the group restudied the items while the other half practiced retrieval by recalling as many items as they could (but without feedback telling them if they got it right). One the next day, half of each group were stressed by being required to solve hard math problems and by giving speeches in front of two judges and three peers. Then they were tested. Twenty minutes later they took a second test on items that had not been tested on the first test. The results revealed that retrieval practice yielded better results. On the first test, we see that the stressed learners who just studied the items the day before had fewer of the items remembered on the first test given immediately after the stress. But there was no such effect on the stressed learners who used retrieval practice during the initial learning. This protective effect of retrieval practice was evident on the second test 25 minutes later. In fact, the retrieval practice effect was better than on the first test, even though different items were tested. You may have noticed that the stressed study group on the second test did worse than they did on the first test. This is attributed to a mild effect of adrenalin, which as mentioned above can have some benefit on memory. Adrenalin’s action is immediate and is apparently swamped on the second test by the delayed release of cortisol, which shows up by the second test. Students might note that the magnitude of difference may appear small, but in percentage terms could equal to more than two letter grades (compare the two stressed groups on the delayed test). To explain why forced retrieval works, the authors speculate that it provides better initial encoding. That is, the new information is registered more strongly if you make yourself try to retrieve it. This is consistent with the everyday experience that most of us have had wherein information that strongly grabs our attention is more likely to be remembered. Forced retrieval is a way to make ourselves pay better attention to what we are trying to lean. Readers wanting to learn more about improving memory are urged to check “Memory Medic’s” books, Memory Power 101 and Better Grades, Less Effort. 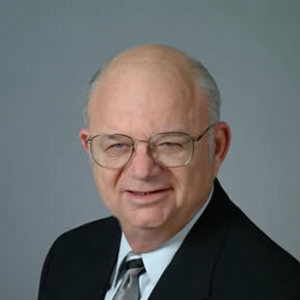 Smith, Amy M. et al. (2016). 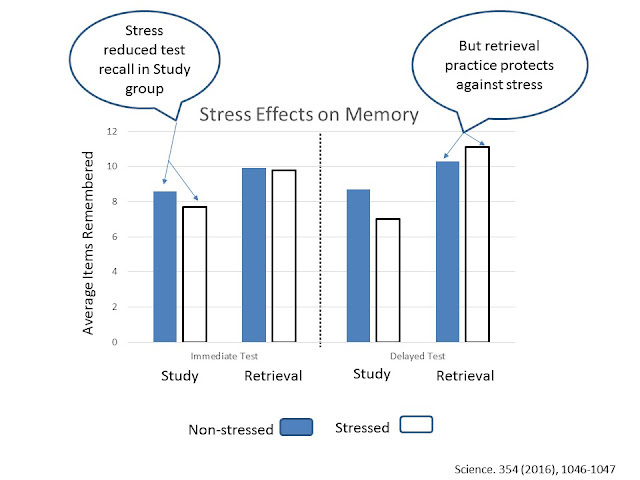 Retrieval practice protects memory against acute stress. Science. 354 (6315), 1046-1047. A version of this article original appeared on Bill's blog, Improve Your Learning and Memory.